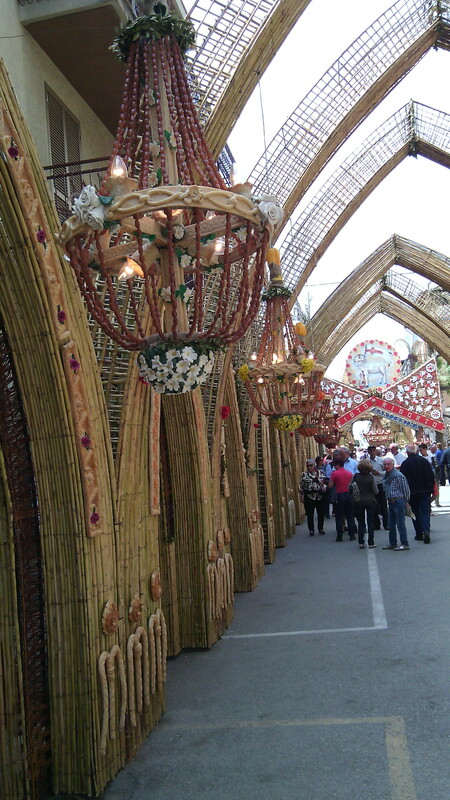 For this Archi di Pane (Arches of Bread) festival, the supporting structures are made from bamboo canes and elaborately woven basket work. Then they add panels of bread all over them. 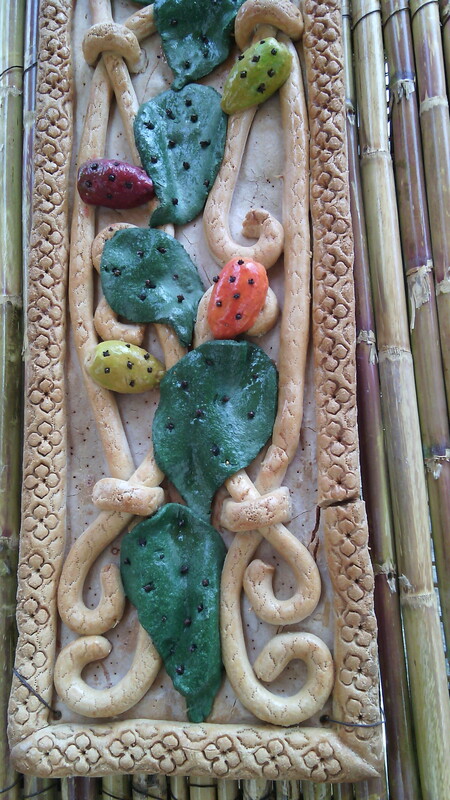 This one has prickly pears on it. 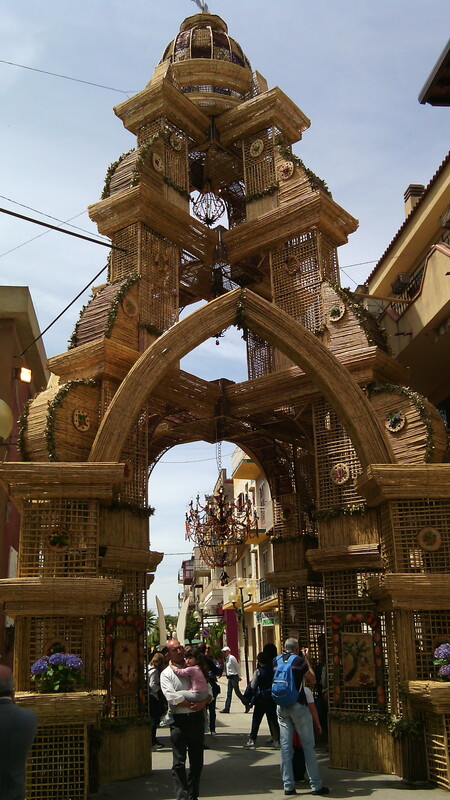 They also illuminate the village with chandeliers made from pasta, beans and more bread. 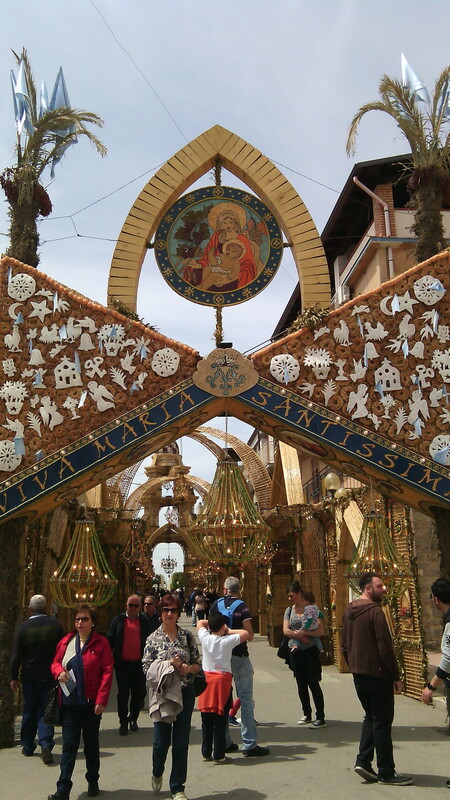 The majority of the locals take part, and the whole village is an outdoor workshop for three months. 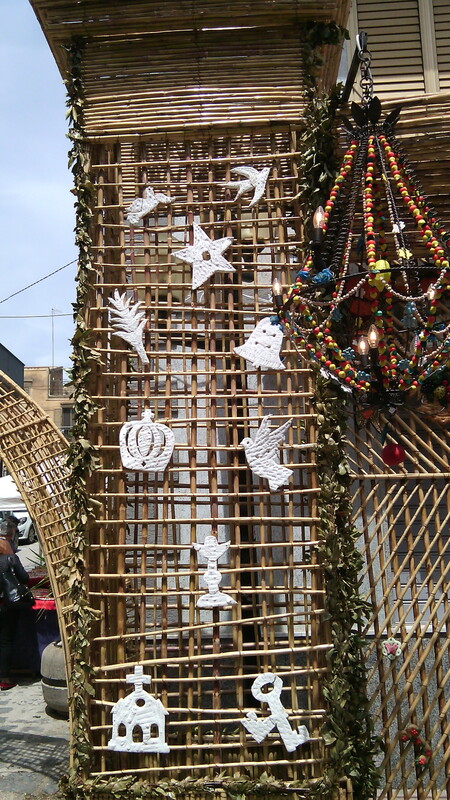 They express their creativity with Easter themes, angels and symbols of fertility and abundance. The very fancy bread has masses of salt in it, to make it rock hard, and it is varnished too so it can survive showers of rain. 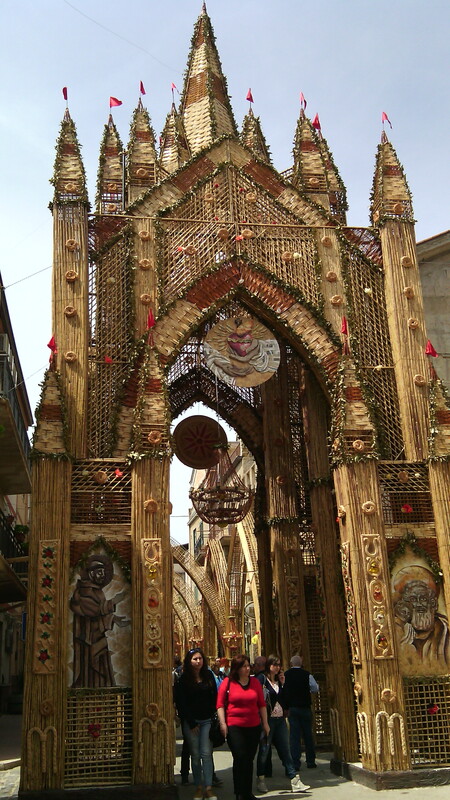 Some of the decorations are made of salt paste. 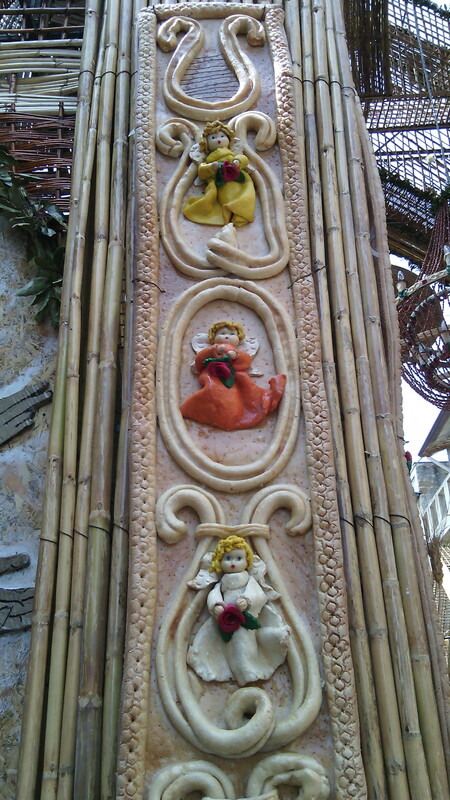 The lower level decorations are made of normal bread, which was clearly too tempting for some people. 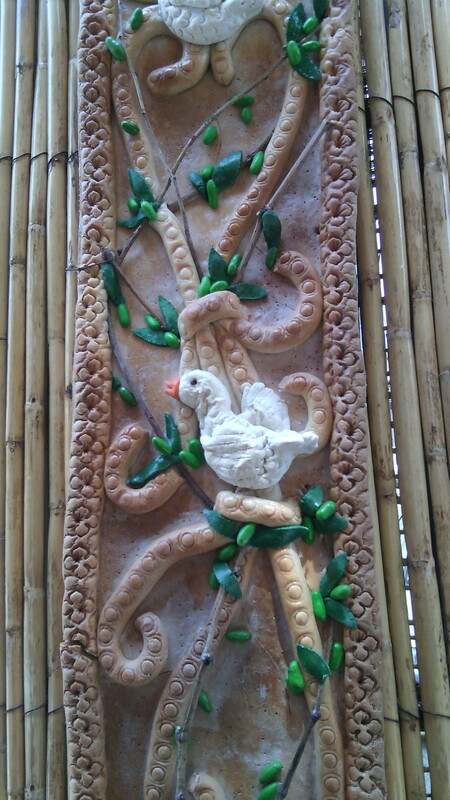 These Easter decorations are biscuits and the white coating is sugar icing, hung on a background which looked like bagels. 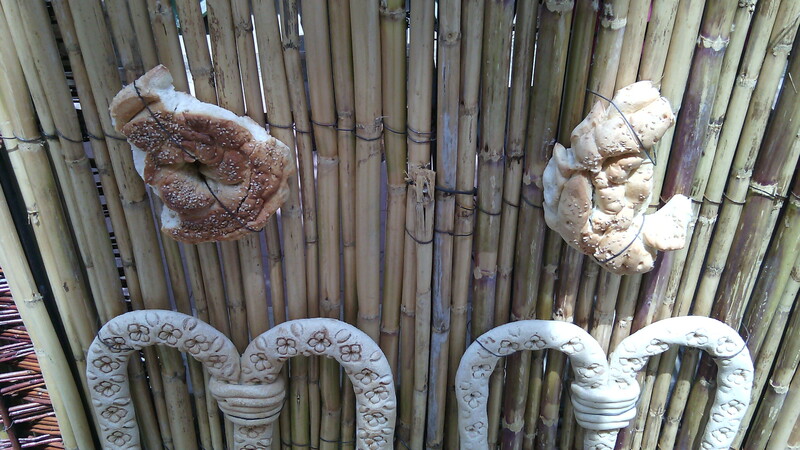 There were individual loaves of fancy varnished bread for sale. I bought several of them. “Mummy, but you’re allergic to gluten,” reminded my little boy. “I’m just going to hang them on the wall,” I reassured him. “When we baguette home,” he answered. Well, doesn’t this chandelier blow your toddler’s pasta projects out of the water? 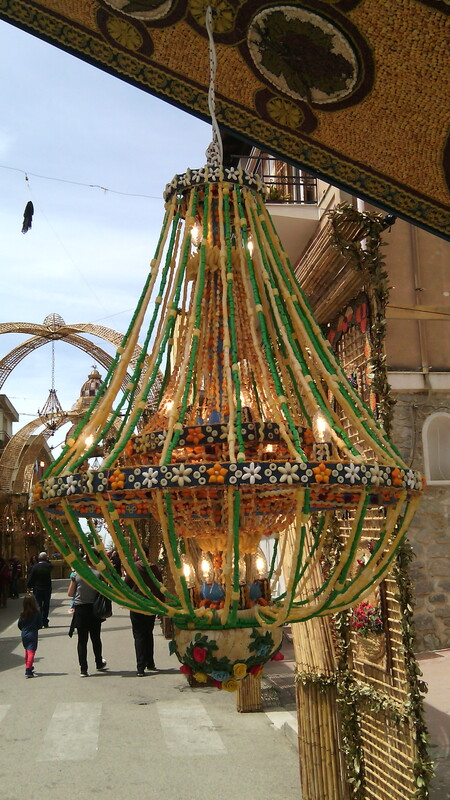 I think only a Sicilian could make a chandelier from bread, pasta and beans that actually looks like a classy piece of decor. 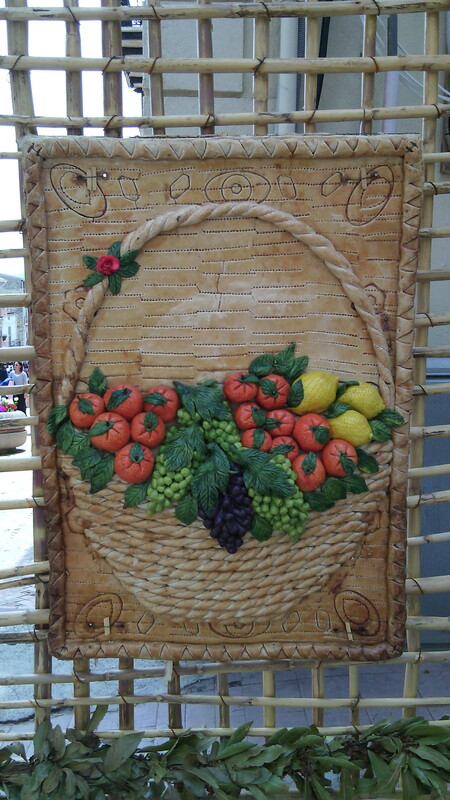 Most of the bread panels represented different types of foods typical in Sicily. 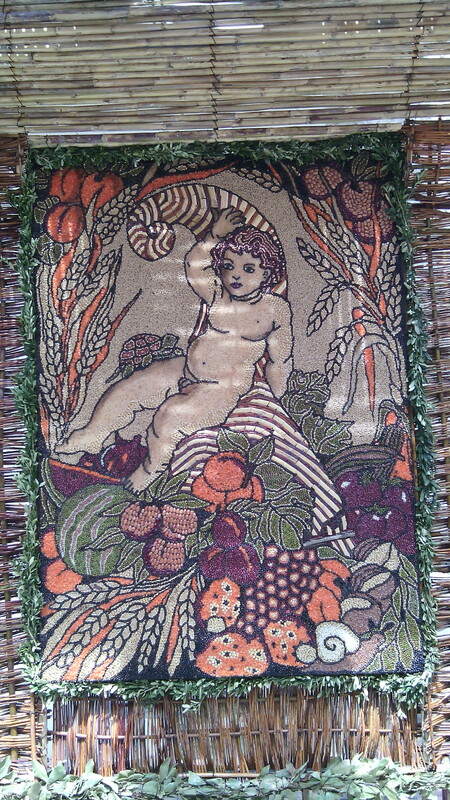 This little cherub is made entirely from grains of rice, beans, lentils and other grains. 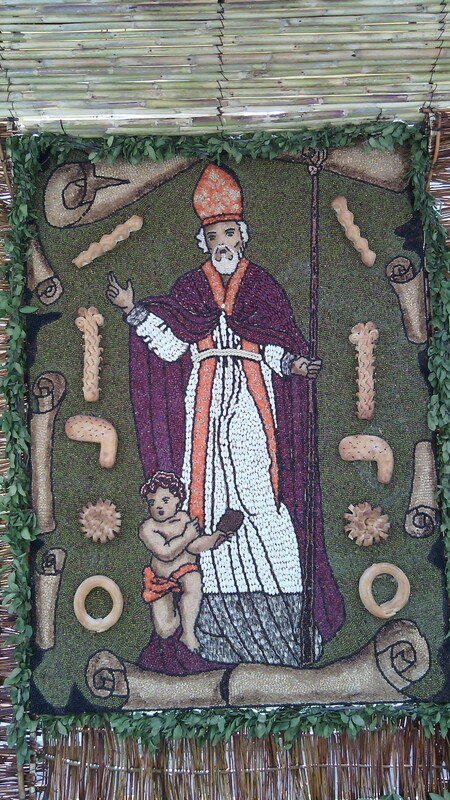 Here’s San Biagio himself, the patron saint of the village, apparently making bread levitate. Usually called St Blaise in English, he was a bishop and doctor from Armenia, whom the Romans tortured to death in the third century A.D. Wild animals used to come to him of their own free will, so he could cure their ailments. Here, he’s bean entirely depicted using pulses. 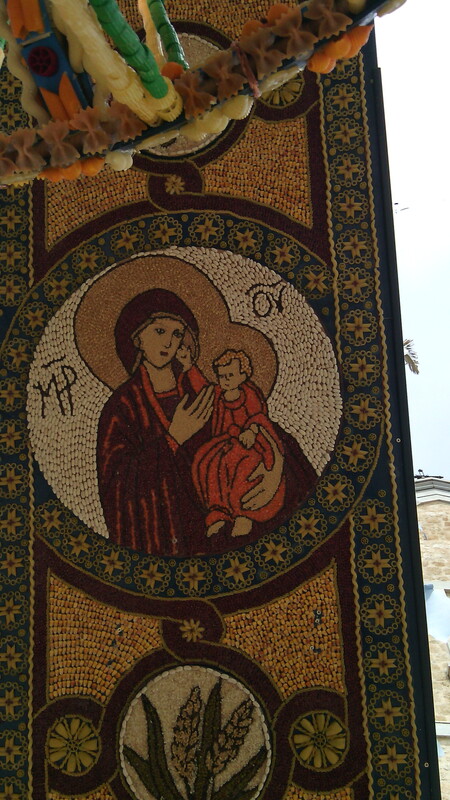 He miraculously saved the life of a little boy who was choking to death on a fish bone, and he is the saint you are supposed to invoke for help if you get something lodged in your throat. I suppose you could also try shoving it down with a mouthful of bread, at the same time. 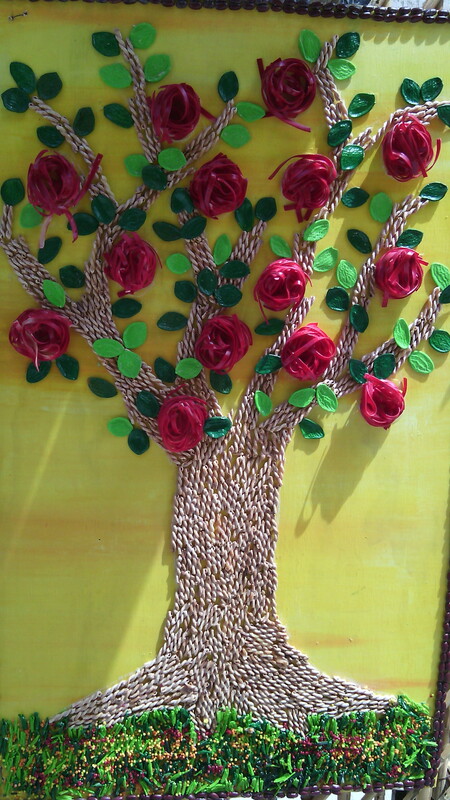 And this, children, is how you make a picture by painting and gluing pieces of pasta. 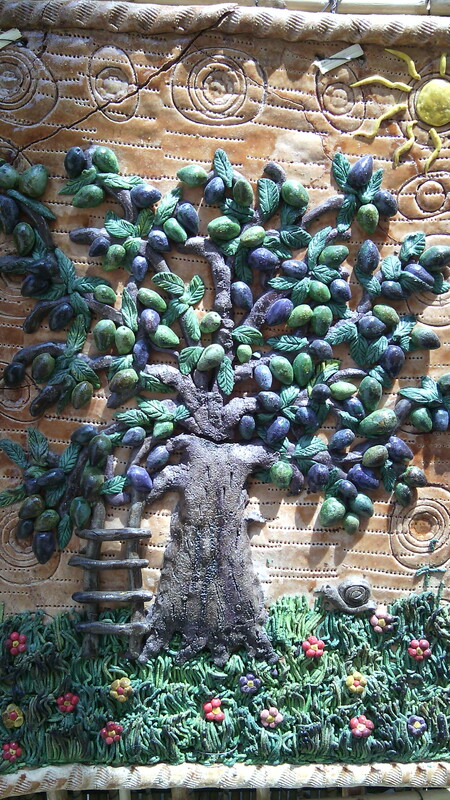 This olive tree was part of an arch that represented the abundance and plenty of Sicily. 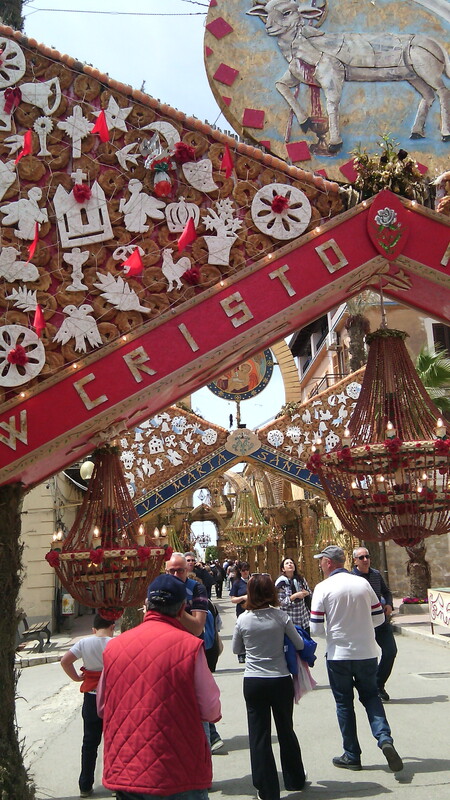 Many Sicilians came close to starvation in Sicily’s recent past, so when they have the chance to enjoy food and plenty, they celebrate it with all their hearts. My son was exhausted after walking around the village all day. I’ve had dreadful backache all week, and was starting to look like a banana. Hubby was carrying all the loot and complained I was using him as a beast of burden. “It was slice to see this, but I’m bready to go home now,” said the little lad. Need to work on your Italian? I so enjoyed seeing this slice of life and laughing at your son’s half-baked jokes. I grew up with my father who could get a rise out of even the most dense person with his silly humor. No loafing around him. I would love to see this sometime. 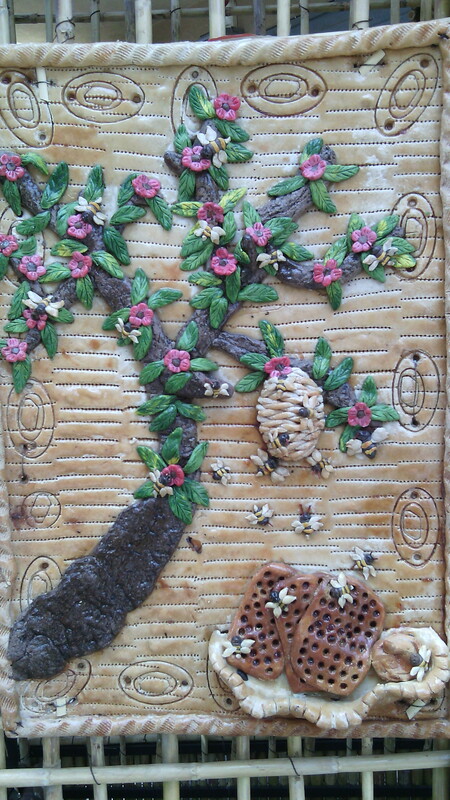 It inspires me to go make art with the food in my pantry. Thanks. LOL!! My son says he thinks your jokes are crumby! My sisters are both champions at puns and always had me in stitches when we were kids. Even though it’s cheesy humour, in Shakespeare’s time it was considered the highest form of wit. And yes, I’ve been feeling like making some of my own creations too. I think I will have a salt dough making session with my son before the week is out! Informative and “funny” article. Your photos are beautiful-thank you for sharing. 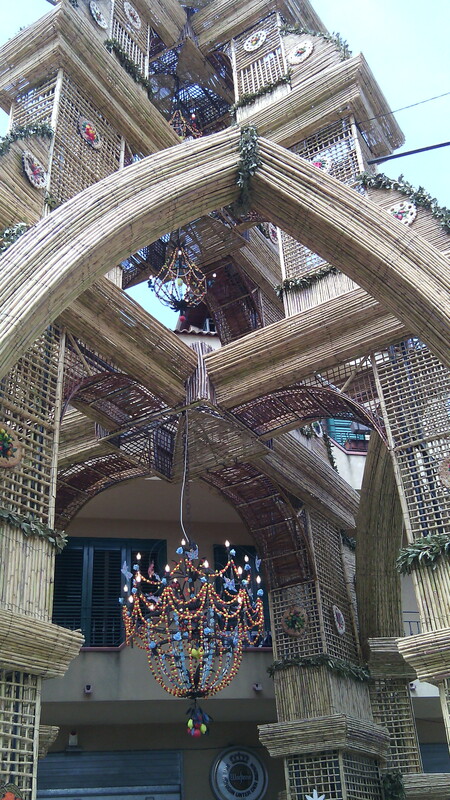 Being in a *gingerbread* village was honestly one of the most magical things I have ever experienced! Your son has fully mastered the English language if he can make so many puns so breadily, I mean readily. We just visited this little bread village last week. It was incredible, but I’m with your son about eating the display. Breadful idea. Thank you! I’m glad you like my blog – I just took a look at yours and I love all the photos! Really wonderful pictures. Thanks for this post. I am glad they still do this. I’m glad you liked the pictures. It honestly was one of the most marvellous things I’ve ever seen in my life!